Telling My Story. Chapter Three. 1962-69. Social Life & More. 2018.54. Deciding to begin my story! 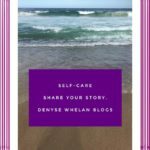 Well over as year ago I finally set upon the journey, after much encouragement I might add, of telling my life’s story via blog posts. My friend Rebecca Bowyer who writes here recommended this way and it has worked so far. I admit though, that the May 2017 post where I started got waylaid by the most inconvenient fact of my cancer diagnosis in the same month. Being a truth-teller and someone who likes to be updating photos and knowledge, I wondered if I might add a new photo which is based on the me now. Here it is. 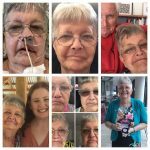 One year post major cancer surgery. 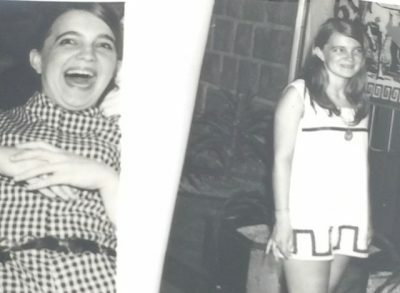 The Social Aspects of My Teens 1962-1969. I am really delving into the memory bank now and what I come up with may not be in chronological order! Music, The Radio and More. When I was 13 I was lucky, oh so lucky, to become the owner of a portable transistor radio. It was light blue plastic, covered with brown leather protection. It ran on batteries. It had a shoulder strap so I could carry it. I cannot recall if it had a power cord. BUT, I was in teen heaven with it. My Dad really understood my love of all things teen music (he was enamoured with the jazz musicians and big bands of the 1930s and 40s. Mum was never into music even though she was an awesome dancer. I wonder if her hearing loss after giving birth twice made her less than keen on music. 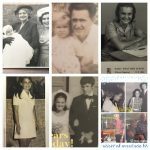 She was, however, a BIG fan of something I never was…talk back radio (told you I would get ahead of myself) and for Mum and Dad’s 60th Wedding Anniversary in 2006 broadcaster Alan Jones wished Mum and Dad all the best. Gosh. I can’t believe I wrote that. Mum and Dad – 60 years wed. 2.11.2006. Sadly Mum became very ill and passed away in March 2007. When I was this age I had already begun babysitting for our neighbours and I know it went well because I got weekly gigs and paid well. It helped with pocket money for the canteen at school. And for purchasing records – 45s at the local music shop. My first record was the Beatles Love Me Do and when I was 14 I was incredibly lucky to be in the audience of the screaming thousands to listen (ha!) and see (almost ha!) The Beatles live in Sydney in 1964. Again I credit Dad with that! We had a two storey house and the main living was upstairs – hilly block. Mum would be cooking dinner and I was, supposedly downstairs studying. I have no idea where my younger brother was. 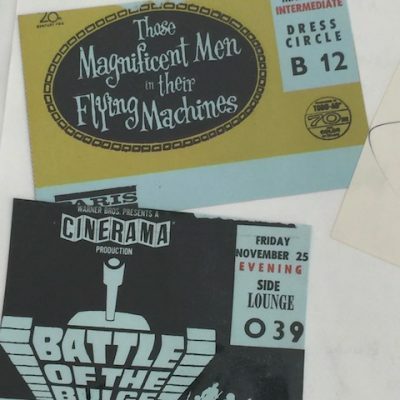 But as I ahem studied I had my radio tuned to 2SM, the Good Guys (Mike Walsh was a good guy) where on the very rare occasion I would ring and win a prize of a movie pass. We had a phone downstairs!! On a sloping block Mum and Dad’s house had entry at street level and then it went downstairs to another level. 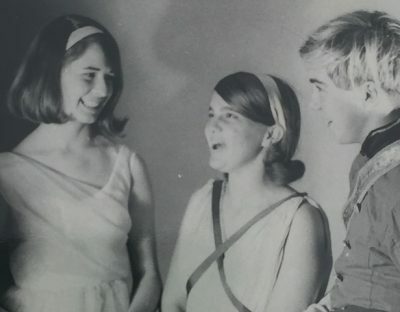 Around the age of 16 my friend Sue and I managed to get to be winners of a competition to be part of Ward ‘Pally’ Austin’s program on a Saturday afternoon. We liked his panel operator, Warrick more than Ward. 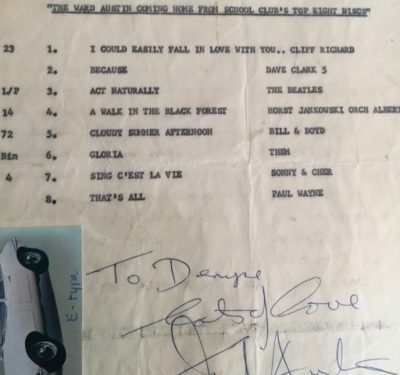 But we both got to chat and I chose a record list for the afternoon. Ward drove both of us across the Harbour Bridge in his top down E-type white jag and then dropped as at North Sydney to get our bus home. O.M.G. famous. OK, there are people who will have different memories of Ward but he was fine with us and we enjoyed our 30 minutes of fame. It might not be social but I recall very significant events which were now, for the main part, televised after we had heard about them on the radio. The assassination of John F Kennedy was a landmark. 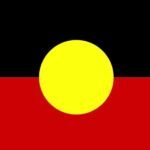 Then later on his brother and Martin Luther Kind Jr. We felt glad to be ‘isolated’ in Australia. Of course, I have to mention the Prime Minister Harold Holt who went into the surf one Sunday on Victoria’s Cheviot Beach and he never returned. So many theories still abound. We watched the Vietnam War on our news stations, particularly Channel Two and This Day Tonight with Bill Peach. So many now retired journos made their start on this show and because of the Vietnam war and Mike Carlton was but one. Of course everything was telecast in black and white and we only had 3 commercial channels and the ABC. I wrote about that here. What I Did On The Weekends & Holidays. 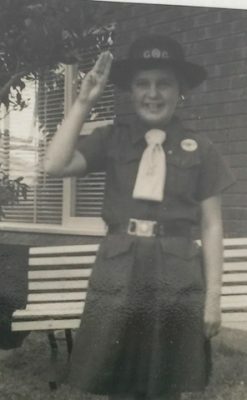 In my early teens I continued in the guiding movement being part of Manly’s groups in the hall in the park above Manly Oval. I would set off via the bus with my friend who lived nearby at dusk on a Friday and we might pop over to the Wharf and watch the donuts being made and buy one. The walk to the oval was not far and we took part in the meetings. Although my parents were stalwarts of the Scouting and Cub movements in their youth and my brother followed there, I was not enamoured. I am so NOT a camping out person, even though I did ONCE and it was a long way from home and the site at Marshall Mount became flooded. My dear Papa, who knew the area well and lived at Dapto, got a taxi out there to see if I was OK. I was…but what a sweet man he was. We returned to Sydney on the train on a dismal June afternoon and caught a ferry at peak hour back to Manly, on a very rocky ferry…we screamed a bit. I was not to know it, till Mum picked us up, that Dad too was on that ferry! I think they stopped the ferries that night according to the news as they showed what happened on our trip! I learned ten pin bowling at Balgowlah Ten Pin. This is now where Stockland Mall is. I liked it a lot there and, you guessed it, found a boy that I liked. Sigh. Young love. 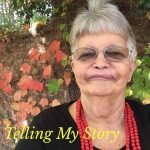 I played netball with some enthusiasm as I got older and mostly because I was in a team with a group from school and we might meet up with some of the boys…I was at a girls’ school…from the high school who came to see their friends. I also found it great once I had my licence so I could get there driving Mum’s car. We did family holidays once a year, by car, and usually to the North Coast in the (then) September holidays. We also went to Canberra once a year as Mum’s aunt lived there and we enjoyed seeing snow for the first time after going down to Cooma and I developed my love for and appreciation of Australia’s capital city. Going to the beach was easy because the bus took me to Manly and then I could walk down the Corso and go to my favourite beach hang – North Steyne. I was not there to ogle the blonde surfer boys. I was there to meet friends and to surf. Body surf, not on a board. On the left: me at North Steyne. On the right: me at North Steyne on the way to Fellowship. BF chopped out. For a reason. The movies were great. Sometimes we went into the city to George Street where there were cinemas on both sides. I saw many movies there with family and friends. There were always 2 features so the main movie was after interval. You also had to stand at the end to listen to the National Anthem – God Save the Queen. Fellowship was a youth group that met at Manly Presbyterian Church. Before I go on. 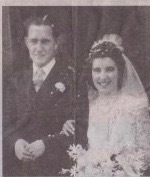 Mum and Dad married in the Presbyterian church and I was christened there. I went to Sunday School. When we moved to Balgowlah Heights there was a new Congregational Church a few streets away and I began attending there because I wanted to join a choir and I started teaching Sunday School. Peak time for me was singing a solo at Christmas and my nerves were such the voice did not do justice to the carol. I taught little kids at Sunday School. For a while. Back to fellowship. A great way to meet people. OK, I admit it, boys. See? This is what it was like. Fellowship at St Andrew’s Manly meant something to eat, join in a discussion probably related to the scriptures and then at leaving time, join your mates at the Balgowlah Coffee Shop. And met one boyfriend there…and another where the relationship lasted 3 years: 1967-1970. The Teen Years of 18, 19 and turning 20. 1968-1969. Turning 17 meant: Licence gained. H.S.C. 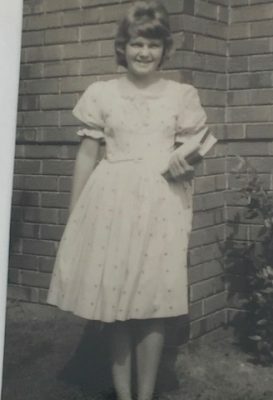 completed, birthday parties and celebrations attended, training in typing (Dad insisted I did a course at Manly Evening College in Wentworth St, above the old Library) and I admit it helps me to this day to know how to almost-touch type. He also made me do shorthand in the January before I got my teacher’s college scholarship and I hated that. Off to be a teacher instead. Yay. More about that next chapter. Very proud of this…and on first go! In 5th Form (Yr 11) in a Gilbert & Sullivan Show with the Boys’ HS. Look who has her mouth open. Unsurprising. Turning 18 and onto 19 and 20: at teacher’s college, doing 5 pracs over 2 years, attending Winter and Summer balls at both Sydney Uni and NSW Uni thanks to boyfriend being a Syd Uni student, parties most weekends for someone’s 21st as he was one year older than me, enjoying LIFE, loving independence even though I still lived at home, going on bush-based holidays and beach ones too thanks to the boyfriend’s family. Wesley College Ball at Sydney Uni (left) and Bacchus Ball #3 for me, Uni NSW right. Life took a more serious but exciting turn for me at the beginning of 1970 and that is where Chapter Four will go. I hope that this trip down my memory lane is of interest. I have been quite amazed at how some memories come back easily. I am also pleased I made some sort of memorabilia after carting around boxes of ‘stuff’ for years as we moved house as young married teachers…but that is for another time. Telling My Story.Chapter One. My Parents. 2017.69. 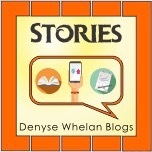 Telling My Story.Chapter One.My Parents. 2017.69. Added: March 2018: This was published one day before I knew I has cancer. Once that was diagnosed a lot of change took place for me as I need to focus on my health, surgery and recovery. The story now picks up again…in mid March 2018 here! 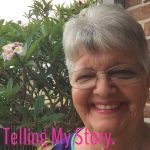 Recently I decided to begin Telling My Story. Initially it was school-career based in a memoir genre. 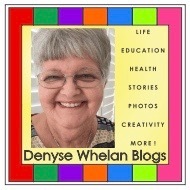 Then I wanted to tell what had happened in my life once I’d reached 60 and what I had learned. Where I am at now it a mix of all of this! 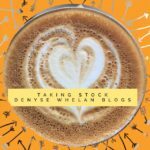 I am going to start here: the beginning of my life, and interspersed with my career will be aspects of my life and how I have grown and changed…over and over! I hope you will find something of interest. I know essentially I am doing this for me as it helps. However, as a blogger, I would like to think it has enough appeal for you to enjoy too. I was born in the last year of the 1940s. Photo taken for my Dad in Melbourne. But before this all happened…. Obviously most memories of early childhood are gleaned from photos and other people’s stories when they tell us too. My life began in a most conventional way, first born to parents who loved each other and already had secured a house. Mum had worked in retail until I was coming along. 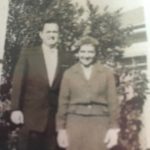 Dad was an accountant continuing his career started at 15 with Australian Iron and Steel Port Kembla (later BHP) and joining a new company when the old one wanted him to move permanently (with me and Mum) to Melbourne for work. He did not want to leave the familiar and family which was based in Wollongong and surrounds. Here’s a bit more to that story…. Dad tells me that in my first year of life when he HAD to go and work in the Melbourne office was one of the worst times he could recall being separated from his loving wife and baby girl. He even had us fly to Melbourne for a stay. What a time that must have been for my mum. 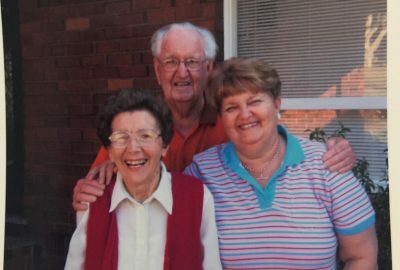 In Wollongong we had loving and caring neighbours who helped Mum find her feet as a new parent. This family was amazing and I loved that we had a gate between our two places and I always felt welcomed there! Dad found another job, which was in the same company he retired from some 30 years later, and the family was complete when my brother was born AND we got our first car. A Holden FJ of course! 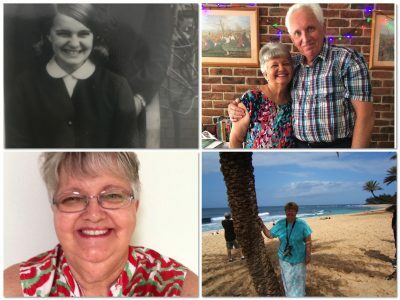 They were born in 1924 and raised in working class families on NSW South Coast, living through the Great Depression and World War 2 before meeting in the 1940s. My Dad is from Wollongong and my Mum was from Dapto. Dad’s father died after a workplace accident at The Steelworks in 1935 and his mother was left to raise 4 children. Dad was the second child aged 11 at the time. He did without but his good marks at school and his willingness to become involved in the community which was predominantly the scouting movement meant he developed resilience and knew the power of having some money to survive. Even though he could have done the Leaving Certificate it was his duty to help support his family so at 15 he went to the Steelworks (AI&S as above) to begin in the role of Office Clerk. Later this would lead to his training as an accountant as he had the mathematics for it! He tells me though, he never ‘got’ algebra. Mum’s parents worked hard, one in the home, and one outside the home at the coal mine at Wongawilli near Dapto. My grandfather had lost an eye in a mining accident in 1924 so they gave him work ‘above the surface’ looking after the workers’ change areas. They helped raise two families. 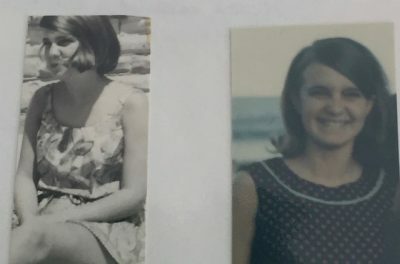 One, their own, of three children (Mum was the youngest, and 2nd daughter) and the family of two boys where the widower was my grandmother’s brother. It was not uncommon in the 1920s and 30s for this to be the case. Nevertheless my mum remembered it as the ‘boys’ got spoiled and did nothing and we girls did all the work around the house. Mum left school at 15 and went into retail where she thrived. So how did a young man from Wollongong meet a young lady from Dapto in the early 1940s when there was a war happening? Dad was exempted from war service (age first, then industry reasons) and Mum had only just left school and was working in retail. However, they were both in the Scouting organisation as leaders in their respective home towns and met at Mt Keira Scout Camp Wollongong. 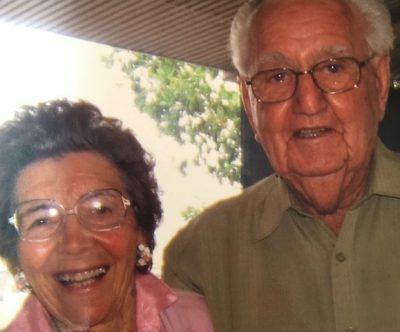 After a courtship of some two years, they married on 2 November 1946 at Dapto. Mum’s cub group put on a guard of honour outside the church. Dad and Mum late 1950s. Still in Wollongong. In 1959 Dad got a job offer within the company he moved to in 1951 and that was of promotion to Chief Accountant at the Sydney office. 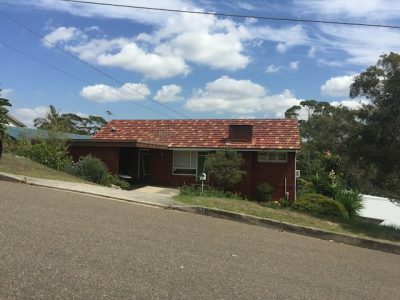 It was one that could not be refused and this time with 2 children, I was 10 by now and my brother aged 7, we moved to what was to be Mum and Dad’s forever house at Balgowlah Heights. They had active social and sporting lives, which continued in Sydney. Mum who had been a district rep in Hockey in her youth, went into tennis and played socially and competitively into her 70s. Dad found golf as a sport and business connection and played each Saturday and then once he retired on a Wednesday. Whenever they went away, their golf clubs and tennis racquets went with them as did groups of friends or they would meet up with friends. Mum loved her cards and working for charities such as the View Club. Both supported me and my brother in scouts and guides and in our sporting and school arenas. 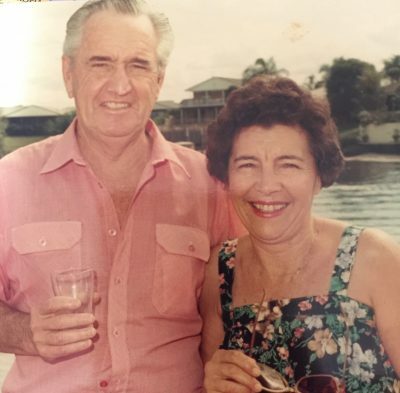 Dad retired in 1983 and they spent 6 weeks annually on the Gold Coast, chasing the sun and meeting up with the many friends who had retired that way as well. Mum becoming unwell in the mid 2000s saw the end of that tradition. Sadly too, by the mid 1980s Mum had lost both her older siblings in their 60s. Dad, now 93, is the longest living member of his immediate family of 4. Mother’s Day 2006. Mum and Dad with me. Up until Mum’s 80th Birthday in December 2004 she had been quite well. A few so-called minor things were wrong and I know where my worry/anxiety gene comes from. But my mum, just as I do, could put on a smile no matter what. 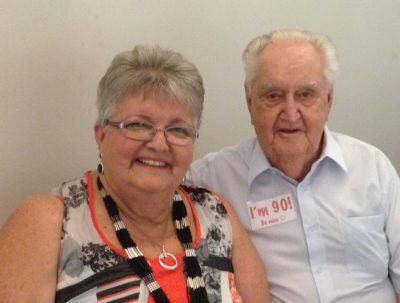 Mum and Dad celebrate 60 years of marriage. 2006. We knew Mum was not well but Dad, as her primary carer, liked to see she did as much as she could that she enjoyed in what ended up being her last 2 years. on 2nd November 2006, after the messages from the Queen and many more, for their Diamond Wedding Anniversary, there was a very special family-only get together, where this photo was taken. After that, Mum’s health sadly declined. Mum was diagnosed with secondary brain tumours in early 2007 We will never know how much Mum knew about her declining condition but she was the one, back in late January 2007 who said ‘no operation’ when it was offered. The specialist and her doctors agreed, along with us, that we would not want Mum to go through that. She spent the next 2 weeks at home and sadly despite Dad’s best efforts to care for her there, she was admitted to palliative care where she died some weeks later. Dad visited every single day. Mum and Dad have always supported our families over the years and of course, we have been there to support Dad in his new status as widower. He stayed in the family home for the next 4 years. He is still fiercely independent and wanted to be there. He did all the jobs as he was raised to do, and learned via scouting. By the end of 2010 loneliness was prevalent and he announced it was time to sell and move on. Along with family help of my brother, sister in law and me he was delighted to find the best place I could have found. In June 2011, after selling at the downturn in Sydney markets (!!) he moved into an airy and spacious independent retirement unit at Dee Why and has more interactions with people every day than ever. He has only given up driving, and the car, in the past month. 3 years ago at Dad’s 90th Birthday. 3 years ago! I love my parents and I was always well-cared for and encouraged to follow whatever path I chose. Dad was keen on continuing education and I when I wanted to become a teacher and remain in the workplace, there was no feeling that I should be at home with the kids. However, my mother, who had always been at home, used to say “Denyse you rush those kids too much”…and sadly I may have but my work at school, along with childcare drop off, was where I was headed. I am more like Dad in personality and less like Mum. Yet I do have some of mum’s anxious disposition and I do enjoy what she did which was to cook and care for her family. She taught me a lot about cooking and I have her recipe books too. She did not encourage me to read, but I did. I was not interested in helping around the house because I preferred to read! 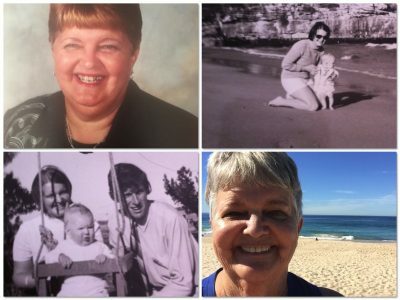 I did not inherit Mum’s sporting prowess but I did her smile and the ability to chat with people. I can do that without my mum’s deafness for which I am grateful. More to come in the weeks ahead! Please tell me if this has been of interest…and if it was too long. I do know I can ramble on so I may need help! I welcome your comments and thank you in advance! Special Times To Remember. #LifeThisWeek 16/52. 2017.55. When I planned this prompt I was thinking about the special time (on this date!) I remembered when I heard that I was pregnant for the second time..after a long gap between children (over 7 years) after being told I would not able to have a second child. Then I re-thought my response and decided to add more. Here they are photos and the special times I remember behind each of them! From left to right and clockwise. Here I am in my principal’s role snapped on school photo day circa 2000. I was very proud to be chosen to be a school principal in my own right after years of being both relieving and acting principal in a number of schools. On Queenscliff Beach on Sydney’s Northern Beaches. May school holidays spent at my parents’ house with my husband and baby daughter. This is in 1972. I don’t think my daughter was keen on the water! Great times spent each time we came back to Sydney from our rural/outback teaching roles from 1971-1977. The face of a relieved and retired person who is learning to make her way through life without roles and responsibilities that she has lived with for over 40 years. Special memories made via selfies on my beach walks in 2016. Young parents! 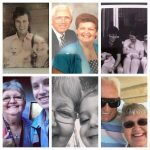 We were 21 when our daughter was born and both teaching in small schools out the back of Boggabri NSW. I was back at work by now (phew, I disliked being at home and isolated on a country property) and this young one is in a swing made by her Dad! We were back at school/work and she was well-cared for next door to my school by my boss’ wife, her godmother. 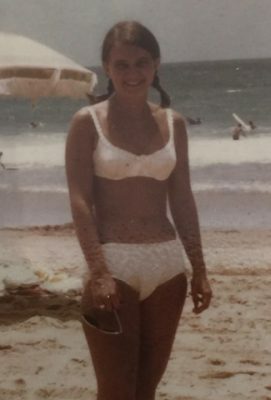 I am around 17 here. This is me, first of the NSW HSC cohort in my senior uniform. It was brown (yuck) and consisted of a skirt, shirt and jacket making it almost ‘suit-like.’ I was not a nerd but a social being at school but finally did remember to study in Year 12 and get into teacher’s college. 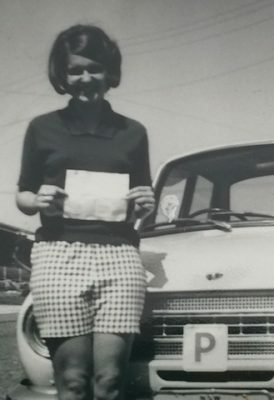 I loved being part of the first group in NSW to do the HSC and it is 50 years ago this year!! The lovely man I married all those years ago – 46 to be exact – with me last Christmas in this house we are renting. We are making special memories right now as for the first time in our lives it is ‘just us’ and no responsibilities for family and work, except for some voluntary work by my husband. Eleven years ago I fulfilled a dream held since teenage years and stood on the North Shore of Oahu looking for the waves that I had sung about in the school bus in the 1960s…”Ride the Wild Surf”…and the surf was flat. Disappointed but a wonderful experience to visit Hawaii..on my first and only (to date) trip out of Australia. Turning 65 meant this…a big grin and relief that my working life was done and I would be eligible for a part-pension. That meant fewer expenses for us as I had no superannuation so it was a good thing. It was also a sad occasion as it was the last birthday I got to celebrate with my whole family in Sydney. I remember it with mixed emotions as in under 2 months we would be gone from Sydney to live on the Central Coast. 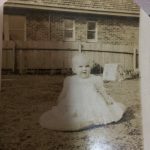 I found this article on memories very interesting and share it from here. Do you find you remember certain experiences and times very well indeed? I do, often remembering the weather, smells, sounds as well as sights. Denyse. I link up each Monday here too: Open Slather with Alicia and Mummy Mondays with Kell. 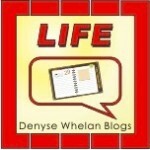 Thank you for linking up for Life This Week. 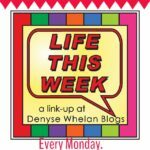 Here are the rules for the link-up “Life This Week” is a link up that runs every Monday and remains live for until Thursday at 5 p.m.during that week. 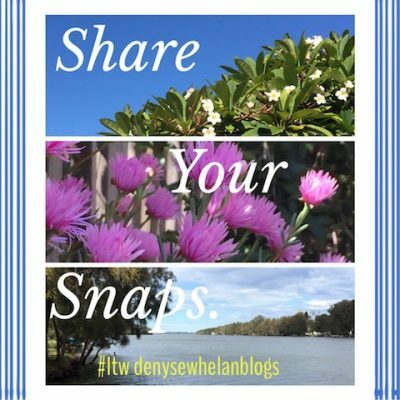 * THANK you for linking up today! Do come back next week. Next week’s prompt is “A.N.Z.A.C. Day”.